You get to do that when you’ve sold dozens of millions of dollars of CERN shares in the past few months and still hold $550 million worth. I feel like a kid watching Mom and Dad get divorced as companies start losing their colorful founders, making me reevaluate whether I still find them interesting. Cerner even lost its president, so now it’s exclusively Brent Shafer’s show and I haven’t seen much Neal Patterson-like brilliance or spark from him after a year in his first CEO job. CERN share price rose a tiny bit Tuesday, but are down 23 percent in the past year vs. the Nasdaq’s 3 percent loss. From Beezer Gutler: “Re: Cleveland Clinic’s Empathy & Innovation Summit. HIMSS is now a ‘partner,’ whatever that means.” I can’t think of many organizations that are less qualified to than HIMSS to provide empathy advice to frontline providers, so I assume that its contribution will be to jam high-paying tech vendors into a program that should be about person-to-person interaction rather than gizmos. The June conference features odd speakers such as bigwigs from Aetna and the AMA (you have to be a pretty awful provider if you have to ask an insurance company how to be empathetic). The conference drew a couple of thousand people last year, although healthcare is notoriously full of people who love to hang around just about any conferences for which patients are indirectly paying via their inflated bills without much hope of ever seeing ROI. It’s fascinating how much money is made by running healthcare conferences – my favorite ironic example is the American Telemedicine Association’s annual conference, which suggests that they believe video is great for practicing medicine but not for watching talking heads. From Avoiding Buyer’s Remorse: “Re: HIMSS19. What should we expect as first timers in a small booth?” You’ll get some visitors, but most will be just strollers-by looking for giveaways and taking your handouts just to be nice. You’ll feel energized and vital in being part of the “show,” but that high will go away on the plane ride home when you realize that spending the money won’t pan out in sales, and if you were an unknown before, you still are. Shooting your budgetary wad on a HIMSS exhibit as a full-year strategy makes no more sense than binge-eating for three days and assuming you won’t need food for another year. The problem isn’t HIMSS, it’s that exhibitors don’t set reasonable goals and plan well, so I suggest starting with my only partially cynical (which is quite a stretch for me) “Tips for HIMSS Exhibitors.” As holder of an expensive, questionably cost effective three-day lease on a 10×10 space myself, I wouldn’t get my hopes up – we get a lot of visitors just because readers drop by to say hello and that makes it worth it to me, but financially it doesn’t make a lot of sense to be there and you probably won’t get nearly as many folks stopping by. Walmart leaves CVS’s pharmacy network after failing to reach a price agreement with CVS’s huge Caremark pharmacy benefits management arm. UnitedHealth Group beats Q4 earnings estimates as its full-year revenue grows to $226 billion and earnings to $17.3 billion. Its Optum services business brought in $8.2 billion in earnings on $101 billion in revenue. It’s good to be a healthcare middleman. California largest non-profit health data network, Manifest MedEx, selects predictive analytics from HBI Solutions. Lexington Regional Health Center (NE) chooses Cerner Millennium via CommunityWorks. Premier Orthopaedics chooses Allscripts Professional EHR, PM, FollowMyHealth, and Payerpath for its 72-physician practice. 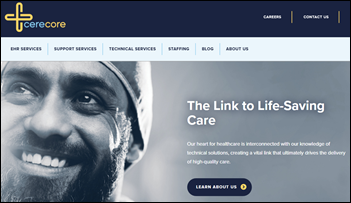 NHS England’s chief digital officer, Juliet Bauer, will leave the organization for a job with NHS-contracted telemedicine vendor Livi. CareCloud successfully deploys Medicomp’s Quippe Clinical Documentation throughout its customer base. DocuTAP launches an urgent care-focused analytics tool called Insight that provides real-time visibility into clinical, operational, and business data. Northwestern Medical Center (VT) goes live on CommonWell interoperability, embedded in Meditech. Walgreens signs a deal for its 380,000 employees to use Microsoft technology that includes Office 365, mobility and security tools, and the Azure public cloud. The companies will also work together on R&D for patient engagement and chronic disease management software. While much of the Cerner implementation will be run by the Office of Electronic Health Record Management, the VA must go beyond just maintaining VistA and ensure that infrastructure is ready for the new system. The VA must continue to invest resources in projects such as its benefits management system, disability rating system, and financial system. The Senator asked for a list of the VA’s IT projects, their priorities, and how those priorities were established. 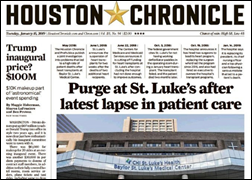 Baylor St. Luke’s Medical Center fires its president, chief nursing officer, and COO following media reports of patient deaths caused by substandard care. The National Center for Health Statistics says Americans are even fatter than previously thought, which it discovered after measuring people directly rather than relying on their self-reported numbers in which they often inflate height and under-report weight. As the old saying goes, I’m not fat, I’m just short for my weight. Those of us who roll our eyes at “influencers” (which is also HIMSS’s new term for “social medial ambassadors who may or not have actual industry influence) will be comforted by the news that they’re being replaced by “avastars,” as companies invest millions to further developer computer-generated, AI-powered synthetic celebrities who not only can generate loyal friends with merchandise-buying potential, but that live forever. 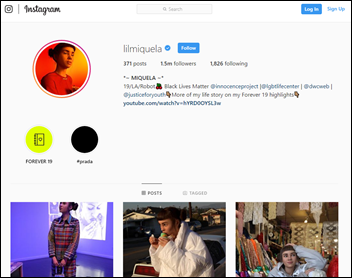 Lil Miquela has 1.5 million Instagram followers, of which I would suspect few are significant contributors to society. AssessURhealth Co-founder Mallory Taylor will present at the Synapse Summit January 23 in Tampa, FL. Bluetree will exhibit at the NJHIMSS 2019 Winter Event January 22 in Monroe Township. The Chicago Tribune profiles Burwood Group President Jim Hart. CoverMyMeds will exhibit at the ASAP 2019 Annual Conference January 23-25 in Kiawah Island, SC. Dimensional Insight publishes a customer spotlight on EvergreenHealth. I admit that I worry about the day Judy hangs it up – she can’t go on forever at 75. I think the only original founders left who have really spent their entire careers at one company are Judy and Neil Pappalardo of Meditech. I feel robbed that Jeff Immelt and a spineless Athenahealth board engineered Jonathan Bush out of the picture. 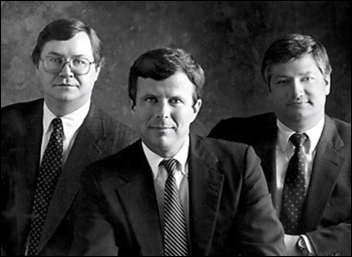 Neal Patterson and JB were rarities in not only taking their companies public and remaining in charge even as their organizations grew hugely, but also refusing to muzzle themselves into becoming tedious corporate bores. Agreed. Life was more interesting with Neal at Cerner, Jonathan at Athena, Glen at Allscripts Rich at IDX …. HIT has lost passionate and interesting leaders… We still have Judy…..who seldom appears but in Gryffindorian splendor! HIMSS show and small vendors. Agree with much of what Mr H said as a former vendor and decades ago small startup. What has always amazed me is that HIMSS was quick to take your money yet offered little or no help in how to get an ROI out of a very expensive ordeal. What they offered was was some pretty basic guidance (do’s and don’ts) that did not amount to much. What is needed is some indepth advise on what to do before the show, during the show, and more importantly AFTER. Seems like maybe that could be another revenue avenue for them?? They do like revenue…right? HIMSS doesn’t need any help in finding new ways to gouge vendors out of more money. For years now vendors have seen diminishing returns on their massive investments to attend. Having a booth has become fairly pointless as they attract typically current customers and not new. Decision makers do not circulate around the exhibit hall like they used to. It is important for attendees to remember that there is no HIMSS convention without the tens of millions invested by vendors. Do them a favor and visit their booths, otherwise, I see more and more vendors opting for other conferences. So true… we have that discussion every year over here, too (we are a small-ish vendor). HIMSS is clearly trying to push more and more services down their exhibitors’ throats. Meanwhile, if we actually bought those services we would quickly lose control of our expenses and cease to be able to exhibit at all! It’s a frustrating relationship and experience. There must be more vendors having those thoughts, as the show seems to be shrinking IMO. Or perhaps it’s just due to overall market contraction.